June 15, 2018 at 11:31p.m. 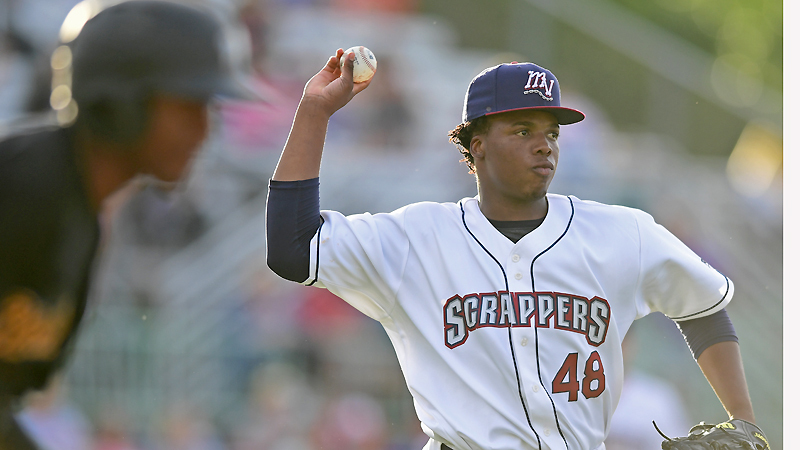 Photo by David Dermer | Scrappers starting pitcher Juan Mota in action Friday night at Eastwood Field in Niles. The Mahoning Valley Scrappers beat the West Virginia Black Bears 9-8 in 10 innings on Friday night in their New York-Penn League season opener at Eastwood Field. The Scrappers trailed 6-3 entering the ninth, but scored three runs to force extra innings. West Virginia took an 8-6 lead in the top of the 10th, but Mahoning Valley rallied again for three runs and a walk-off victory. The game at Eastwood Field is the start of a three-game series, and the first of 38 scheduled home games for the Scrappers. Scrappers first-year manager Jim Pankovits replaces Luke Carlin, who last year led the team to a 44-29 record and a Pinckney Division title in the New York-Penn League. Scrappers outfielder Clark Scolamiero is one of 11 players on the opening day roster who were with the Scrappers in 2017. He says that Pankovits and the rest of the first-year Scrappers are in for a treat. Through 19 seasons, the Scrappers have made five trips to the playoffs and a NYPL title in 2004. They have drawn more than 2.5 million fans to Eastwood Field. June 15, 2018 11:17 p.m.
June 12, 2018 6:55 p.m.
June 15, 2018 12:05 a.m.